With our help, you'll be listening to a good book in no time. Which Kindles are compatible with audiobooks? Your Kindle provides more than one way to devour a good book. If you own a set of Bluetooth headphones or a Bluetooth-enabled speaker, you’ve got everything you need to start enjoying audiobooks streamed from your Kindle eReader (we review the best Kindles). Let's get started! If you have even a passing interest in audiobooks, you’ll likely have heard of Audible. If not, here’s your chance to get acquainted. Founded in the mid-1990s, Audible is, arguably, one of the largest purveyors of audiobooks and other aural consumables in the world. While there are a number of ways to enjoy Audible content, including smartphone and tablet apps or on your computer via Audible’s website, this guide focuses on how to do so with your Amazon Kindle eReader. Amazon’s found a way to make switching from reading an eBook to listening to an audiobook a nearly seamless experience. Thanks to Whispersync for Voice, many of the books available to buy via the Amazon Kindle Store can be synced with their audio iteration, purchased from Audible. So, when you stop reading your Kindle to head to work, Amazon’s Whispersync for Voice service will ensure that the Audible version of what you were reading picks up where you left off. Of course, you’ll have to pay for this privilege by investing in both the eBook and the audiobook from Amazon. 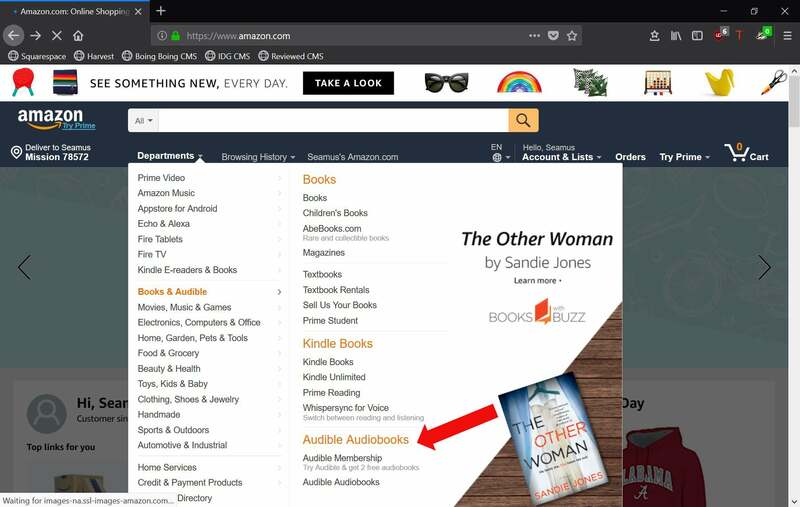 While it’s still possible to buy narrated books and other narrated content directly from Audible’s website, Kindle owners can use their Amazon account to buy Audio books via Amazon’s web store. There are a few ways to do this. The choice to invest in an Audible subscription or to buy your audiobooks without one should be dictated by how much you read and how much you want to listen to. The first is to navigate to the Audible section of Amazon’s website. After signing into your Amazon account, click the Departments button, located underneath the search bar at the top of your Amazon homepage. A drop-down menu will appear. Halfway down, you’ll see the Books and Audible option. Scrolling over this option will open up a submenu. At the bottom you’ll find two options: Audible Membership and Audible Audiobooks. At the time that this guide was written, an Audible subscription cost $14.95 per month, with one free month up front. During this trial period, Amazon will hook you up with two free audiobooks. If you decide to cancel your subscription at the end of the one-month trial, the audiobooks are yours to keep. An Audible subscription will net you one free audiobook per month, regardless of its cost. In addition, you’ll receive a 30% discount on any audio content you buy from Audible. Finally—and this may be the best membership perk of all—Amazon will let you swap out any Audible books you’re not enjoying for free. If you listen to books less frequently, it’s also possible to buy Audible books and magazines a la carte. If you like the idea of being able to sync the books you read on your Kindle via Whispersync for Voice with its Audible audiobook counterpart, Amazon makes it easy to do so. You’ll be encouraged to buy the audiobook version of eBooks you buy from Amazon’s Kindle Bookstore (if one is available) before finalizing your purchase. 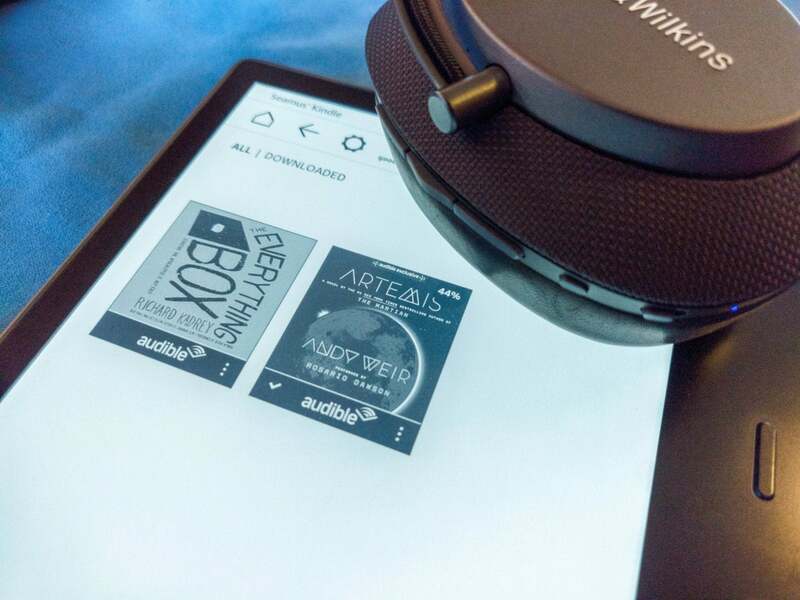 Once you own an Audible audio product, it’ll be wirelessly delivered to your device (providing you own a compatible Amazon Kindle), where you can load it up, use it, or archive it, just as you would a Kindle eBook. If you’re an old-school eBook aficionado, you’ll be pleased to know that Audible content can be used on first and second-generation Kindles, Kindle Keyboard and the Kindle DX. If you own one of these devices, you needn’t read any further. Simply plug a set of headphones into your device’s 3.5mm jack and you’re in business. Depending on the operating system version these older devices are running, you may also be able to listen to sideloaded MP3 files or Audible .aa and .aax audio files. We've reviewed all the available models and made our recommendations in our roundup of the best Kindles. If you haven’t listened to audio content with your Kindle in the past, you should know that doing so, will cause your device’s battery to drain faster than you may be accustomed to seeing—especially older devices, whose batteries are starting to poop out. If you own an eighth-generation Kindle (aka 2016’s All-New Kindle,) or an eighth- or ninth-generation Kindle Oasis (released in 2016 and 2017, respectively), you’ll be able to use your eReader to listen to audiobooks purchased from Audible. Unfortunately, at the time that this guide was written, these more recent devices don’t allow users to sideload audio content. If you want to listen to an audiobook using any of these three devices, they’ll have to be bought from either the Amazon or Audible website and transferred to your Kindle via Whispersync. You may have noticed that, unlike older Amazon Kindles, such as the DX or the Kindle Keyboard, these latter-day devices don’t come equipped with a headphone jack. So, let’s talk Bluetooth. To pair Bluetooth headphones or a speaker with your 2016 Kindle, or your eighth- or ninth-generation Kindle Oasis, start by placing the audio device you want to pair with your eReader in pairing mode. Next, tap the top of your Kindle’s display to open the e-Reader’s tool bar. Then, tap the Quick Actions icon: It’s the one that looks like a gear. Now, select All Settings. One of the options on your Kindle’s Settings page should be Wi-Fi & Bluetooth. Select it. After ensuring that your Kindle isn't set to Airplane Mode, tap the on-screen toggle next to Bluetooth. Below this option, a new option, labeled Bluetooth Devices, will now become available. Tapping Bluetooth Devices will open allow you to pair your Bluetooth headphones or speaker with your Kindle When you see the name of your audio device appear on your Kindle’s display, select it to complete the pairing process. Your speakers or headphones should be ready to use with your Kindle. After pairing set of Bluetooth headphones or a speaker with your Kindle, you'll be ready to kick back and listen to a good book. 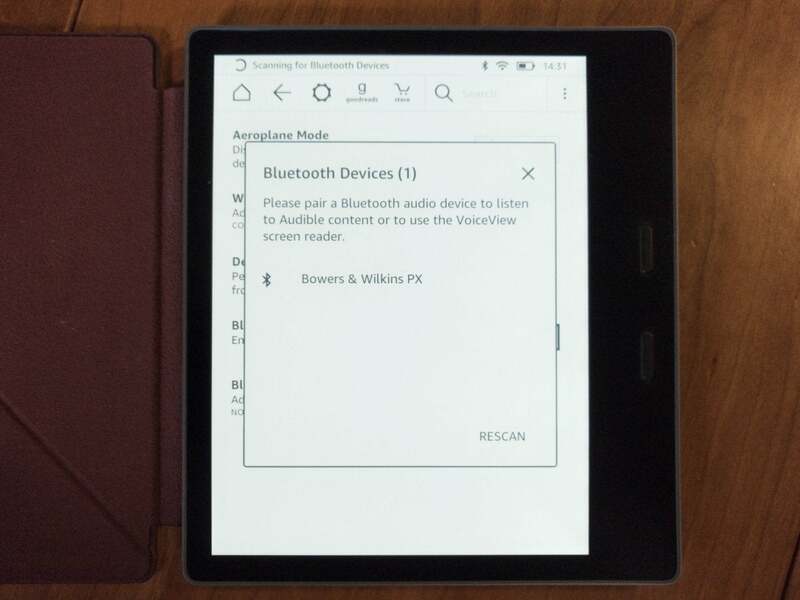 If your Kindle failed to pair with your audio device, make sure that your speakers or headphones are still in pairing mode and tap Rescan, located in the bottom right of your Kindle’s Bluetooth pairing interface. To listen to your any of the Audible content that you’ve purchased, ensure that your paired audio device is powered on and download the content that you’d like to listen to. Just like with your Kindle eBooks, any Audible content you download to your Kindle will be accessible via your device’s homescreen. Tap the audiobook to open it. You’ll have a number of control options: play/pause, the ability to advance or reverse the audio track by 30 second; speed, volume, and chapter controls, and the ability to create a bookmark. All that’s left to do now is press Play and enjoy. If you own a Kindle Paperwhite or the recently discontinued Kindle Voyage, you won’t be able to use them to listen to Audible content. However, it is still possible to have your Kindle read to you. This $20 Audio AdapterRemove non-product link was designed by Amazon to help the visually impaired use their line of Kindle eReaders. By plugging it into the micro-USB charging port of your Kindle, you’ll activate VoiceView, Amazon’s audio-based user interface. Plug in a set of your favorite headphones, or a cable attached to the Aux output of your stereo, and you’ll be ready to listen to a text-to-speech conversion of millions of compatible titles from the Kindle Store. The audio you’ll hear won’t be of the same quality as you’ll get with the talented voice actors that Audible employs to narrate its audio content, but it’s certainly better than nothing.